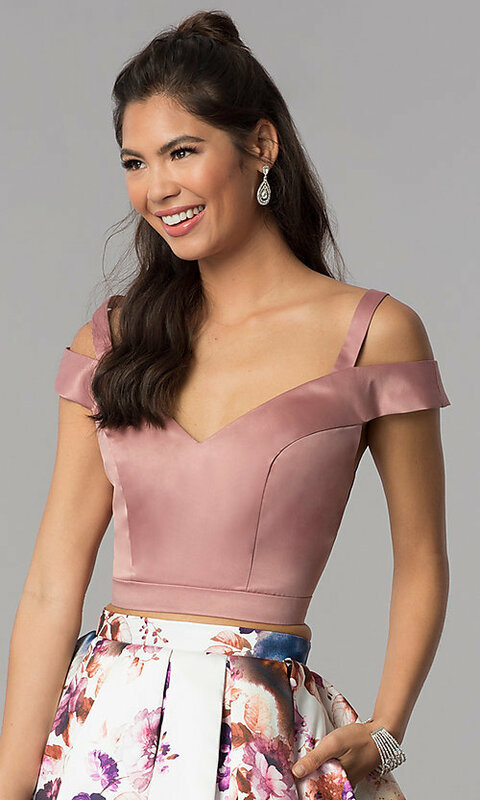 Get ready for hoco 2019 with this short two-piece homecoming dress that offers a reason to celebrate fashion. Crafted from smooth satin with a fun floral-print skirt, this junior-sized party dress has a flirty vibe that's all its own. 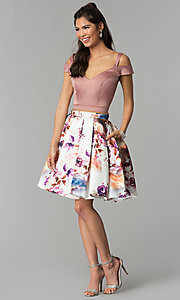 A cold-shoulder sweetheart neckline sets the tone for a sweet look that's magnified by the girly flair on the tulle-lined a-line skirt. A small break between the crop top and skirt highlights the figure, and the box pleats add volume to the short print skirt that catches attention with every spin. As if this short homecoming dress couldn't get any better, convenient little pockets grace the sides for toting the necessities with style.